A Hooda, M Rathee, J Singh. Chewing Sticks In The Era Of Toothbrush: A Review. The Internet Journal of Family Practice. 2009 Volume 9 Number 2. There is a long history of the use of plants to improve dental health and promote oral hygiene and is still commonly practiced among Afro-Asian communities. Pencil sized sticks are fashioned from certain plant parts and are chewed on one end until they become frayed into a brush and the brush end is used to clean the teeth in a similar manner to the toothbrush. The plant parts when used in this manner are commonly referred as the “chewing stick”. Their use still continues in the modern era of dentistry. It is inexpensive and easily available in rural areas. Further they are used for customary and religious reasons as well. Several studies have demonstrated the anti-plaque, anti carious and antibacterial effect of these sticks. The effect of the chewing sticks and the modern toothbrush and tooth paste on the oral and dental hygiene are reviewed. Chewing sticks are commonly used as oral hygiene tool in various parts of the world. The choice of stick depends largely on traditional preference rather than clinical effectiveness. It is an affordable oral hygiene device and additional benefits are derived form its functional aspect of chewing as jaw exerciser as well as reflex induction of saliva which is beneficial to the oral hygiene. The lower incidence of dental caries amongst users of chewing sticks (compared to non-users) has been attributed to the superior mechanical cleansing action on the teeth and to the antimicrobial properties of some of these sticks.1-3 A review of the efficacy and usefulness of chewing sticks in comparison to the toothbrush and toothpaste in dental hygiene is being presented. Rinsing with slurry of miswak toothpaste reduces gingival inflammation and bleeding on probing.36 Chlorhexidine and miswak were compared and chlorhexidine (CHX) was found to be more effective than miswak in plaque reduction. It was found that streptococcus mutants were eliminated in the miswak group and were less in CHX. Gazi et al37 reported that plaque and gingivitis were significantly reduced when miswak was used 5 times a day compared with conventional toothbrush. Guile et al concluded from a survey of Saudi school children that the low incidence of periodontal disease was attributable to the practice of using miswak for teeth cleaning.38 In general, it is concluded from the above- mentioned studies that reduction in plaque leads to a decrease in gingivitis and ultimately a reduction in bleeding from the gums. Mohammed and Turner23 were the only one who studied the cytotoxic potential of the miswak using the agar overlay method. No cytotoxic effect had been noticed. However, the bristles may penetrate the gums during use thus causing some discomfort.6 Unlike a modern toothbrush, the bristles of miswak are situated along the long axis of its handle. Consequently, the facial surfaces of the teeth can be reached more easily than the lingual surfaces or the inter-dental spaces. The direction of cleansing bristles is parallel to the long axis of stick, thus it may not be possible to access all the surfaces of whole dentition easily. Oral hygiene is important for the well being of whole body. The use of toothbrush sticks for the oral and dental hygiene is well documented. Chewing sticks are used for not only for oral hygiene but for religious and social reasons. The use of natural toothbrush can be made more beneficial by proper technique and regular use particularly in rural areas. 1. Enwonwu C. Socio-economic factors in dental caries prevalence and frequency in Nigerians: an epidemiological study. Caries Research1974; 8:155-171. 2. El-Said F, Fadulu S, Kuye J, Sofowora EA. Native cures in Nigeria, II. The antimicrobial properties of the buffered extracts of chewing sticks. Lloydia 1971; 34: 172-1 74. 3. Akpata ES, Akinrimisi E. Antibacterial activity of extracts from some African chewing sticks. Oral Surg, Oral Medicine, Oral Pathol 1977;44: 717-728. 4. Al-Sadhan RI, Almas K. Miswak (chewing stick): A cultural and scientific heritage. Saudi Dent J 1999; 11: 80-8. 5. Almas K, Al-Lafi TR. The natural toothbrush. World Health Forum. 1995 ; 16 : 206-10. 6. Evans WC. Trease and Evans' Pharmacognosy. 15th ed. W.B. Saunders, London, 2002. 7. Gerrit B. The Miswak, an aspect of dental care in Islam. Medical History 1993; 37:68-79. 8. Almas K. Miswak (chewing stick) and its role in oral health. Postgrad Dentist Middle East 1993; 3: 214-18. 9. Tripathi BN. In “Charaka-Samhita” Part I Chapter 5, Sutra Suram, chaukhamba, Subharti Prakasham Varansi, 2002; p.130-1. 10. Akhtar MS, Ajmal M. Significance of chewing-sticks (miswak) in oral hygiene from a pharmacological viewpoint. J Pak Med Assoc 1981; 31: 89- 95. 11. Hardie J, Ahmed K. The miswak as an aid in oral hygiene. FDI World. 1995; 4: 5-8, 10. 12. Alali F, Lafi T. GC-MS analysis and bioactivity testing of the volatile oil from the leaves of the toothbrush tree Salvadora persica L. Nat Prod Res 2003; 17 (3): 189-94. 13. Darout IA, Christy AA, Skaug N, Egeberg PK. Identification and quantification of some potentially antimicrobial anionic components in miswak extract. 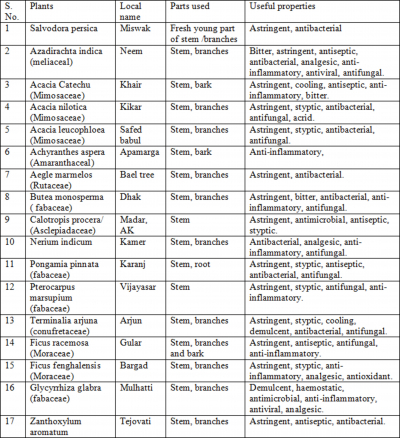 Indian J Pharmacol 2000; 32: 11-14. 15. Kubota K, Tanaka T, Murata Y, Hirasawa M. Effect of tannic acid on adherence of Candida to denture base. J Dental Research 1988; 67: (suppl) 183. 16. Almas K. Miswak (chewing stick) and its role in oral health. Postgrad Dentist 1993; 3: 214-18. 17. El Mostehy MR, Al-Jassem AA, Al-Yassin IA. Miswak as an oral health device. Preliminary chemical and clinical evaluation. Hamdard 1983; 26:41-50. 18. Dorner WG. Active substances from African and Asian natural toothbrushes. Chemische Run-dschau 1981; 34: 19-23. 19. Grant J. Miswak- toothbrushes that grow on trees. Todays - FDA. 1990; 2: 60. 20. George ET, William CE Pharmacognosy. 12th ed. Bailliere Tindall 1985; p 95. 21. Abo Al-Samh D, Al-Bagieh N. A study of antibacterial activity of the miswak extract in vitro. Biomedical Letters. 1996; 53: 225-238. 22. Farooqi MIH, Srivastava JG. The toothbrush tree (Salvadora persica). Quart. J. Crude Drug Res. 1968; 8: 1297-99. 23. Mohammad A, Turner JE. In vitro evaluation of Saudi Arabian toothbrush tree (Salvadora persica). Odontostomatol Trop 1983; 3:145-148. 24. Ezmirly ST, El-Nasr MS. Isolation of gluco- tropaeolin from Salvadora persica. J Chem Soc Pak 1981; 3: 9-12. 25. Al-Bagieh NH, Weinberg ED. Benzylisothiocyanate: a possible agent for controlling dental caries. Microbios. 1988; 39: 143-151. 26. Brown JM, Jacobs JW. An investigation into antibacterial activity in chewing sticks against oral streptococci. Odontostomatol Trop. 1979; 2: 25-30. 27. AI-LafiT, Ababneh H. The effect of the extract of the Miswak (chewing sticks) used in Jordan and the Middle East on oral bacteria. Int Dent J. 1995; 45: 218-22. 28. Hattab FN. Miswak: The natural toothbrush. J Clin Dent 1997; 8: 125-29. 29. Al-Otaibi M, Al-Harthy M, soder B, Gustafsson A, Angmar-Mansson B. Comparative effect of chewing sticks and tooth brushing on plaque removal and gingival health. Oral Health Prev Dent 2003; 1: 301-7. 30. Hardie J, Ahmad K. The miswak as an aid in oral hygiene. J. Phillipp Dent Assoc 1995; 4: 33-38. 31. Ndungu FL, Kaimenyi JT, Arneberg P, Muthami LN. A comparative study of the efficacy of plaque control by a chewing stick and a tooth brush. East Afr Med J 1990; 67: 907-11. 32. Danielson B, Baelum V, Manji F, Fejerskov O. Chewing sticks, toothpaste, and plaque removal. Acta Odontol Scand 1989; 47: 12-5. 33.	van Palenstein Helderman WH, Munck L, Mushendwa S, Mrema FG. Cleaning effectiveness of chewing sticks among Tanzanian schoolchildren. J Clin Periodontol 1992; 19: 460-3. 34. Eid MA, Selim HA. A retrospective study on the relationship between miswak chewing stick and periodontal health. Egyptian Dent J 1994; 40: 589-92. 35. Norton MR, Addy M. Chewing sticks versus toothbrushes in West Africa. A pilot study. Clin Prev Dent 1989; 11: 11-3. 36. Al-Khateeb TL, O’Mullane DM, Whelton H, Sulaiman MI. Periodontal treatment needs among Saudi Arabian adults and their relationship to the use of the miswak. Community Dent Health 1991; 89: 323-28. 37. Gazi M, Lambourne A, Chagla A. The anti- plaque effect of toothpaste containing Salvadora persica compared with chlorhexidine gluconate. Clin Preventive Dent 1987; 9: 3-8. 38. Guile E, Al-Shammery A, Backly M, Lambourne A. Periodontal status of school at tenders in Saudi Arabia. J Dent Res 1988; 67: (suppl) 1456. 39. Almas K, Al-Zeid Z. The immediate antimicrobial effect of a toothbrush and miswak on cariogenic bacteria: a clinical study. J Contemp Dent Pract 2004;15:105-14. 40. Almas K. The antimicrobial effects of extracts of Azadirachta indica (Neem) and Salvadora persica (Arak) chewing sticks. Indian J Dent Res 1999; 10: 23-6. 41. Taiwo O, Xu HX, Lee SF. Antibacterial activities of extracts from Nigerian chewing sticks. Phytother Res 1999; 13: 675-9. 42. Rotimi VO, Mosadomi HA. The effect of crude extracts of nine African chewing sticks on oral anaerobes. J Med Microbiol 1987; 23: 55-60. 44. Muhammad S, Lawal MT. Oral hygiene and the use of plants. Scientific Res and Essays 2010; 5: 1788-1795.